DirectoryBind - move data to external_sd (GameLoft, Shadowgun etc.) ROOT req. 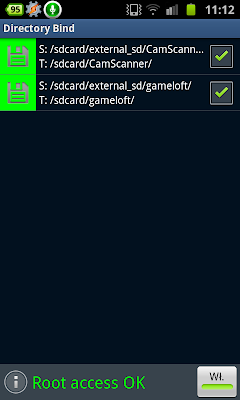 This is my application to bind directories located on external_sd to directories on internal memory (/sdcard/). 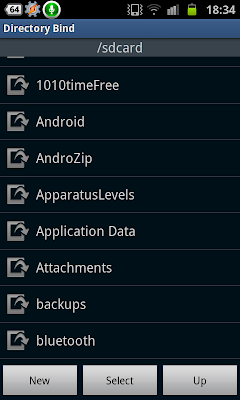 This way You can transfer large application data directories to external_sd. Could be usefull with ex. : games from Gameloft, other like Shadowgun, applications like CamScanner. * auto create target directory action moved from "bind" action to "add/edit entry" action due to possible problems when data outside "/sdcard"
Compiled using API android 2.3.3. Attached as self-signed development apk package. No market link for now. * Remember ! All entries must be umounted before attempting to use MASS STORAGE MODE. Application will try to do it automatically on USB CONNECT. If it fails and You'll use MASS STORAGE MODE sdcard partition WILL CRASH and reboot will be required to restore normal operations ! Main cause of that is appplication using mounted folder. You have to close that application and retry to umount entry. * This application requires *root privileges* so it has full control over entire system! Uses root privileges to invoke "mount", "umount", "lsof" and "grep" shell commands via su and it DOES NOT write anything on system partitions. It DOES NOT apply any permanent changes to the OS, however I cannot guarantee it does not contain BUGS and security issues. I'm not responsible to any damage it can cause. Use it AT YOUT OWN RISK ! *ROOT* - invoking "mount", "umount", "lsof" and "grep" commands via su. !!! IF YOU HAVE ISSUE WITH ENTRIES DISAPPEARING AFTER REBOOT !!! Is this app similar to Link2SD?